Another good game gone bad. The Gingerbread men have left the confines of their sugar-frosted land and let their rage spill over into yet another family-favorite board game, where total carnage has its 'ups and downs'. The board's original slides and ladders once helped teach kids about morality. But in SHOOTIN' LADDERS: Frag Fest, you'll more likely learn a lesson in 'mortality' and that everyone gets their just desserts. So sling your M&M16, load your Dessert Eagle and get ready to blast the other cookies to bits as you climb and slide your way to victory! If you liked tearing the limbs off cookies in Run for Your Life, Candyman!, meet its big brother. This game is not just one game, it is a collection of 7 Action-Packed Scenarios with both Team Play and Free-for-all Modes. Yep. Form teams and try your hand at Candyman Flag Capture or play a round of Head Hunter where the goal is to take all the other team's heads before they can nab yours. There is a sniper scenario where it is a whole squad against one cookie, last man standing scenarios and a scenario called Trophy Room where the cookie who collects the most body parts wins. Some scenarios have respawns - but all have body parts flying like never before as you roll as many as 12 dice of damage on opponents with a Gatling Gumdrop or Bigg Redd. Plus, the game supports 8 players. New cookie characters, GInger Joe and Sgt Rockk Candy, join Bitey, Stinky, Mr Crumbles and the rest of your favorites with all new, fun token images. Weapons come with ammo counters to keep track of your shots and can be reloaded with Ammo cards, plus there is Gear aplenty - everything from Kevlar Icing to C4reo charges. This box is chock full of mayhem - and fully customizable for your own scenarios. Here. just look at the back of the box... What's not to love? 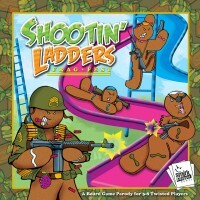 Add a Review for "Shootin’ Ladders: Frag Fest"